6 How do I purchase a kit? 7 What is included in the kit? Today is World Autism Awareness Day. 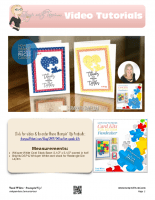 In honor of this celebration, I’ll be sharing my Love you to Pieces Autism Fundraiser Card kits and how you can be a part of this special event and make a difference. We are raising funds for Autism Speaks. Together we can make a difference! This kit features the Stampin’ Up! Love You to Pieces bundle (stamps and die set), along with the supplies needed to make 4 cards and envelopes. And to stretch the value of this awesome “kit for a cause”, I’ll be creating a bonus card with the left over kit supplies for this class. Why just purchase the stamp/die bundle, when for just a few dollars more you can get the entire card kit, that includes a donation to Autism Speaks? It’s a win-win! Click here for more details on the kits. $15 donation per kit will be made to Autism Speaks. 10% of all orders using this code from April 1-15 will be donated to Autism Speaks. Make a $25+ Direct Donation directly to my Autism Speaks Campaign and receive free Love you to pieces pdf tutorial via email (International). Kits will ship on April 22. BONUS CARDS: There will be enough supplies left over to create the 2 bonus cards I made on the video.